More than marketing — contextualized disclosures: A strategic plan narrative is not a recitation of good news stories. Initiatives should be contextualized to help investors assess their significance. Forward-looking information: A long-term plan is an opportunity for a company to meaningfully talk about the future across a broad range of value-relevant topics, accompanied by goals, metrics, and milestones. In addition to the baseline content, Tomlinson notes that CEOs can enhance their presentations further by including disclosures around five key themes: risk factors and mega-trends; corporate governance; capital allocation; human capital management; and shareholder and stakeholder engagement. The paper offers examples from presentations delivered at SII’s CEO Investor Forums, including by BD, Delphi, PG&E, Medtronic, Merck, Aetna, Telia, and Prudential. The study is built off the feedback from hundreds of investors that SII received about the 20+ presentations at SII’s five CEO Investor Forums over the previous two years. The Forums are a part of SII’s work to promote “long-termism” on Wall Street and in the C-Suites of the world’s leading companies. 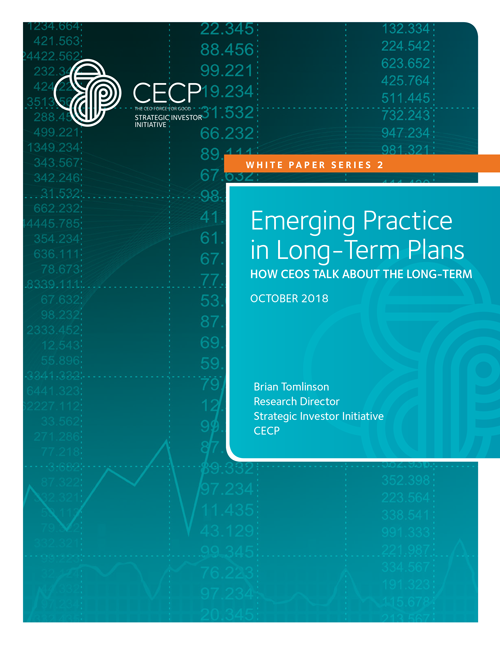 SII’s Investor Letter also informs Tomlinson’s paper – specifically the seven questions CEOs should answer in their long-term plan presentations. The letter was signed by nine leading investors from SII’s Advisory Board, including SII co-chair and Chairman of Vanguard Bill McNabb. Most recently, Harvard Business School Professor George Serafeim co-authored an article in Harvard Business Review that offers preliminary indications that CEO presentations of long-term plans at SII’s CEO Investor Forums have a market impact, particularly on trading volume.